All right, let’s get one thing out of the way: Chron Goblin offer nothing new, nothing that hasn’t been done before. However, even though they lack originality, they are simply perfect for anyone who enjoys loud guitars, pounding drums and a good old rock’n’roll atmosphere. If you are a fan of Black Sabbath, for example, you will certainly enjoy the nostalgic trip brought to you by these young Canadian rockers. We can also compare them to the likes of Kyuss, Corrosion Of Conformity, or even some recent bands such as Baroness and Red Fang. That does not necessarily mean they are able to fill their shoes (which is a difficult task to undertake, let’s be honest), it just means that they recreate that sludgy, wild and heavy musical atmosphere. Their songwriting is simple, but it works and that is all that matters. Backwater sounds furious and passionate, which isn’t too surprising since it was recorded by Adam Pike, who has worked with Red Fang, Rabbits or MDC. In other words, this really is a thunderous record. If you need music for informal social gatherings, long road trips or simply to have fun by yourself, then this is a great choice. However, the fact that their sound isn’t exactly groundbreaking might hurt them. In the age of information, where we can discover many new bands on a daily basis, Chron Goblin might get lost in the shuffle in favour of more hyped acts. However, those who are into desert/southern rock (and rock in general) will certainly be happy with this collection of powerful songs. The quality of the guitar riffs, for example, will make you bang your head like there’s no tomorrow. Fuller or Give Way are some of the best tunes, although the slower and groovy Backwater also deserves a nod. 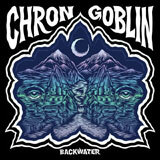 In the end, we could spend all day talking about Chron Goblin and their latest offering, but nothing more needs to be said .There are some albums that lose their magic if overanalyzed, and this is definitely one of them, so we shall turn our brains off now, relax and just rock out. Rock is not dead! !